The historic London Terrace Gardens rental complex was widely considered the largest residential apartment complex in the world when it was completed in 1931. 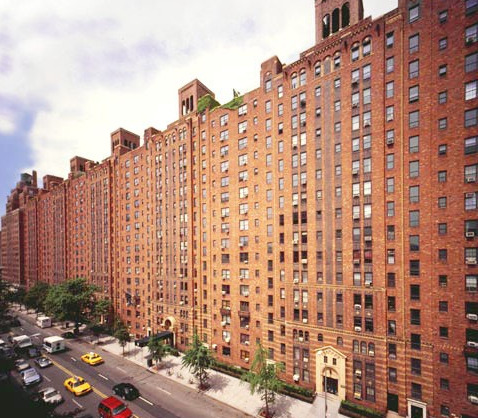 The pre-war mid-rises at London Terrace, located at 435 West 23rd Street in West Chelsea, are a series of 10 buildings that take up the entire block between 9th and 10th Avenue, and also have a serene interior garden available to residents. London Terrace offers classic pre-war style and modern comforts and conveniences in one of Manhattan’s most popular neighborhoods. The 921 pre-war apartments in London Terrace exhibit classic New York style and all the typical characteristic of pre-war luxury; the spacious rooms, oversized windows, and stylish black-and-white tiled bathrooms are all designed in a distinctively pre-war fashion. These luxury apartments have also been updated to meet modern luxury standards. The kitchens have been fully renovated and the windows are double-glazed for excellent insulation from both sound and the elements. London Terrace features a host of amenities that rival any new luxury rental in the current Manhattan listings. These classic buildings boast 24-hour concierge service, a private health club with steam room and sauna, and even a full-size indoor pool. Additional amenities include a 19th-story roof-deck with excellent Manhattan views, laundry in every building, and an elegant and serene private garden. London Terrace is situated right next to the High Line Park in West Chelsea, a Manhattan neighborhood renowned for both its innovative arts scene and it excellent boutique shopping and international restaurants. I would like information on apartments in London Terrace. Please contact me ASAP.